See that little fella chilling on the rock? He is not supposed to be there. At least, to our knowledge, no Octopod should exist at the depth this photograph was taken. 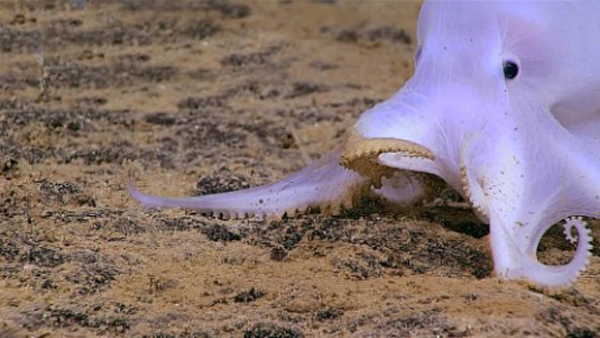 Because of his coloration… the internet has cleverly stupidly dubbed the new discovery ‘Casper’ and ‘Ghost Octopus’. 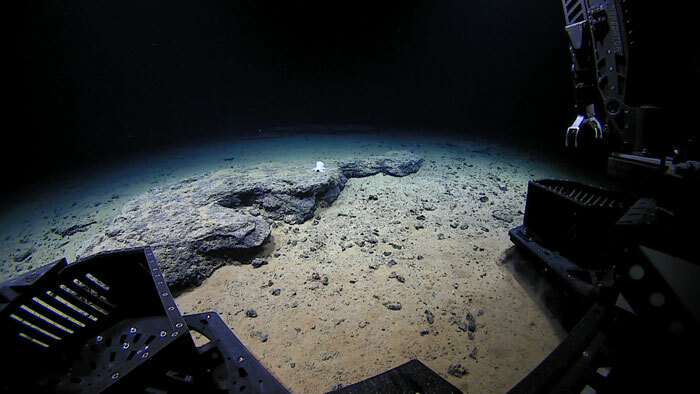 The struggle for a name arises from the fact that the exploration that stumbled across this treasure wasn’t looking for biological samples, rather, was diving at an extreme depth of over 4,000 meters to do geological studies. The ROV (Remote Operated Vehicle) Okeanos Explorer discovered the creature northeast of Necker Island (Mokumanamana) in the Hawaiian Archipelago. The octopod imaged in detail on this first dive was a member of the second group, the incirrates. A distinctive characteristic was that the suckers were in one, rather than two, series on each arm. This animal was particularly unusual because it lacked the pigment cells, called chromatophores, typical of most cephalopods, and it did not seem very muscular. I should not exist… yet I do. Fear me. It is almost certainly an undescribed species and may not belong to any described genus. Never trust an Octopus… although they do take out sharks. But then we will have to breed Sea Lions to deal with the Octopus problem. But of course, everyone knows sea-lions are the John Stamos’s of the ocean, so they breed like wild-fire. So we’ll need to train up a fleet of killer whales to handle the roving hoards of sea-lions. Because we all know killer whales like to be trained and love humans.